When Creed hit theaters, audiences were introduced to a new character in the tried-and-true Rocky universe. Now, fans are given a worthy sequel, as the story of Adonis Johnson (Michael B. Jordan) continues. The sequel's director, Steven Caple Jr., follows the usual tropes of a boxing movie, but does so elegantly and with purpose. Creed II is full of heart and tension, and succeeds in making the 130-minute film feel like a frantic 12-round bout. Featuring a cast of old villains and heroes, like Ivan Drago (Dolph Lundgren) and Rocky Balboa (Sylvester Stallone), it is both nostalgic and fresh, a rare feat in filmmaking today. Adonis, also known as Creed, is fresh off the heels of his almost victory against undefeated "Pretty" Ricky Conlan in the light-heavy weight championship, a fight that rocketed Creed to stardom and forced the boxing world to take him seriously. The fame soon comes at a price, however, as Drago's son, Viktor (Florian Munteanu), challenges him to a fight. Thirty years after Ivan Drago killed Apollo Creed in the ring, Adonis has a chance to avenge his father, all while establishing himself as one of the world's top boxers. Billed as a "fight born from tragedy", Creed must also consider doing what is right for his family. 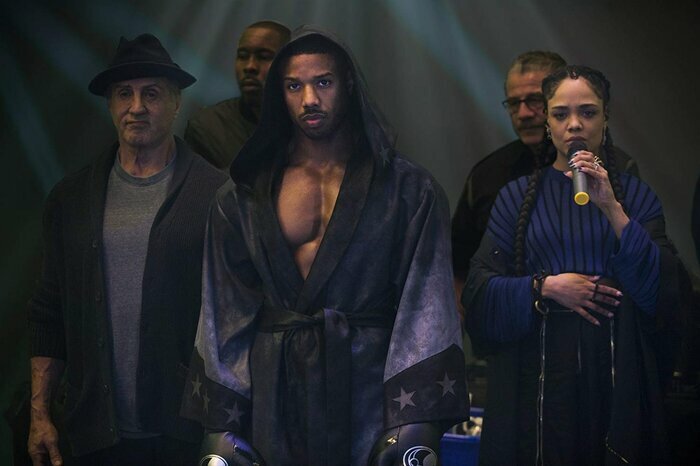 His trainer, Rocky, his girlfriend, Bianca (Tessa Thompson), and mother, Mary Anne (Phylicia Rashad) all weigh in on the fight, but in the end, it is Adonis' decision to make. Like many great films based on sport, Creed II focuses on the characters, allowing them to build up the drama before the gloves even touch. Sylvester Stallone taps into his inner Rocky once again, further cementing his legacy as one of the best on-screen characters of all time. Tessa Thompson's performance as Bianca, an aspiring musician with progressive hearing loss, is admirable, and she is one of the most likeable and engaging supporting characters in recent memory. On top of the impressive acting and storyline, the boxing action is also worth mentioning. Every landed punch can almost be felt throughout the audience, every crack can send shivers down your spine. There is a point, somewhere in between unbelievable and unrealistic, that many boxing movies venture into, with the intention of ramping up the drama. Creed II rarely crosses this line, instead relying on a certain affinity for its characters to provide drama. Sure, this film is structured around some of the most obvious clichés; the arrogant superstar, the temper tantrums, the apologies and most importantly, the montages. But it is how Caple Jr. navigates around these clichés that is impressive. Nothing in Creed II feels unnecessary. No character goes ignored; there is even meaningful character development for the villain, Viktor Drago. By giving each character a reason to be on screen, Caple Jr. and his writing staff are able to amplify every tense minute, including some unforgettable fighting scenes in the final moments.